There are a lot of free activities for kids in Southern Utah. The St. George area is a year-round recreational haven for singles, couples and especially for families. There are so many free activities for kids they will never be bored. 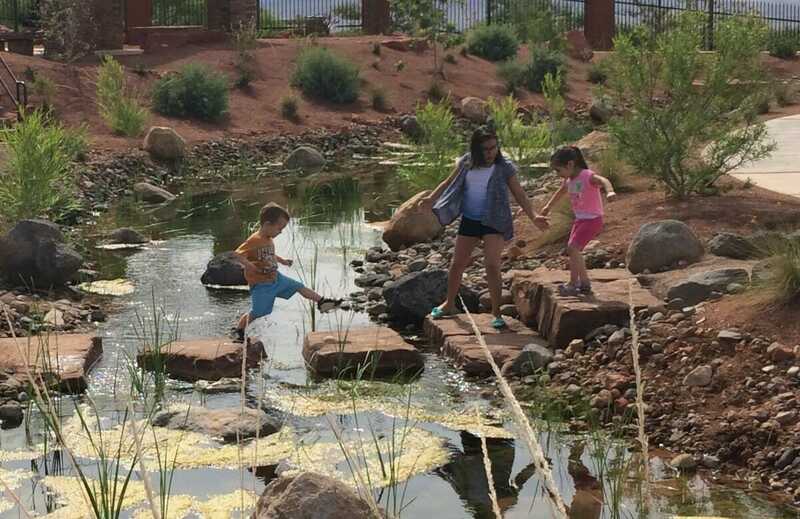 There are parks for the kids, and adults alike, strategically placed all over town, Dinosaur tracks, museums, ATV riding, bike trails, petroglyphs, tons of water activities and so much more. 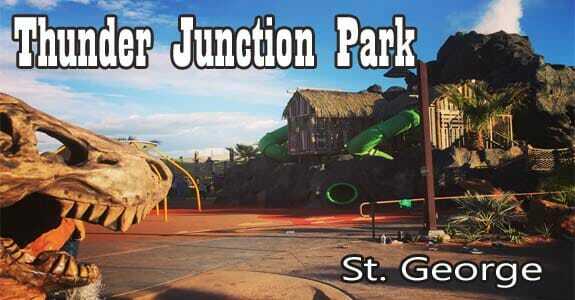 Thunder Junction, an all abilities park, has recently opened in St. George, UT. This is a special one of a kind park where no one is left out. Everything is accessible to everyone regardless if you are in a wheelchair, use crutches or not. The park has a dinosaur there with some really great features like an “erupting” volcano, splash pad and a 1/4 -scale train that has a 2,700-foot track. This remarkable play space offers accessible and sensory-rich play space that will enchant and delight children and adults with or without disabilities. 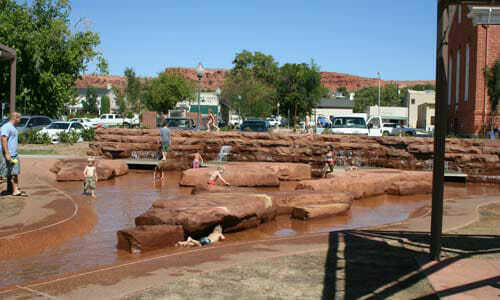 Pioneer park is one of the most fabulous and free places to visit in the St. George, UT area. It is not your typical park because there is no grass or playgrounds. You have an entire 52-acre park that is a natural playground just waiting for you to explore. If your kids love to climb on rocks, then this is the place to come to. You can stay close to the parking area and still be able to climb several rocks or you can take the trail and find the historical pioneer cabin, Boy Scout Cave or connect off on another trail system to explore the Red Cliffs Desert Reserve. The views from the top of Dixie rock are out of this world! Adjacent to Pioneer Park is the Red Hills Desert Garden. The primary focus of the garden is to teach and promote water conservation and landscaping principles but it is really so much more. There are waterways where you can hop on rocks to get over the water or take a bridge, watch the fish swim on by or you can head over to the view area. With the viewing area, the public can view the Virgin River’s native fish in the fish’s habitat. The Plexiglas panel is a great way to see how fish live in the lakes and streams in the area. A fun surprise is the faux rock replica of a slot canyon. The canyon walls tower over you and kids love the feeling they are on a mountainous hike complete with overhanging archways. After checking out the “slot canyon” don’t forget the bonus trail over to the boulders where the kids can enjoy lots of rock to climb on and caves to explore. About 15 miles outside of St. George is the Warner Valley Dinosaur Tracks. This area is popular with adults and kids alike because it’s easy to get to as well as having the ability to see over 400 dinosaur tracks in one concentrated area. With many of the dinosaur tracks, you can see the toe pads and claw marks. You can see dinosaur footprints left behind by dinosaurs from the eubrontes and the grallator groups from the early Jurassic period. It is always fun to compare your foot size to a massive animal that roamed the earth many, many years ago. This popular destination is just a few miles south of St. George on the Arizona strip a nd well worth the drive out. 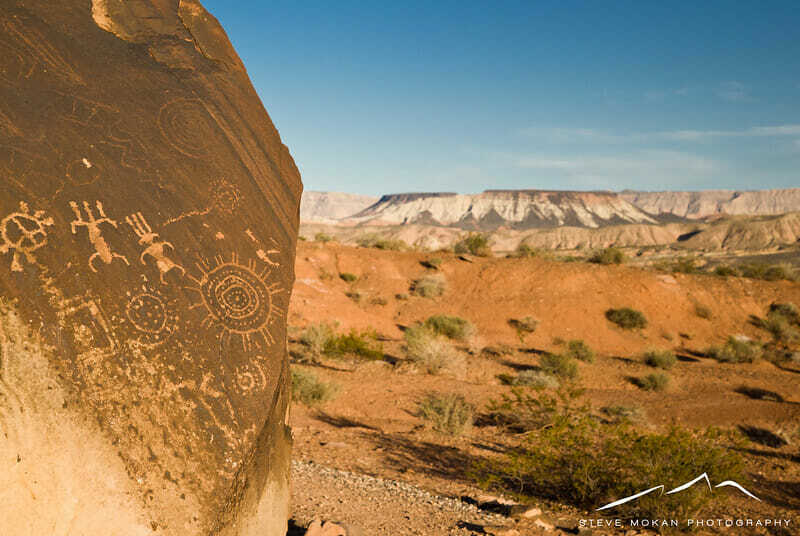 The Little Black Mountain Petroglyph site dates back over 6,000 years with over 500 individual rock-art designs, petroglyphs and elements on the cliffs and boulders. Along the 1.2-mile groomed trail you will notice the petroglyphs are mostly on the south side of the rocks and boulders. Kids really love this outdoor activity. While you are there don’t miss going over to Glitter Mountain too. In the same area as Little Black Mountain Petroglyph site you will also find Sparkle or Glitter Mountain. Glitter Mountain is an old gypsum mine just one mile over the Utah state line into Arizona. It is a huge glittery mountain of fun! The gypsum looks like glittering crystals you can take home with you. Don’t forget to bring something to chip away gypsum fragments from the pit. If you don’t want to chip off any rock, then you can just pick up a piece of the glittery rock from the thousands that are scattered on the ground. Bring a bucket to put the gypsum in so you can take a souvenir back to family and friends. Town Square Park is located in downtown St. George City, inside the historic district on Main Street. This park is fabulous for children and adults alike. There are several dramatic water features, a great splash pad fountain with jets that spray high into the air to cool off in the summer months. Adults and kids really like the lazy river running throughout the park. They can wade in the water of the river to cool off their feet or play in the splashing waterfall. There is a lot of grassy area as well as pavilions with tables and chairs for relaxing. One of the newer additions to Town Square Park is the Carousel. It is a classic 36-foot carousel that features over 1000 lights, two sleighs and 30 beautify hand-painted horses. Children and adults alike can’t resist an old-fashioned carousel! The St. George City Children’s Museum is also located within the park. This is a great place to take kids of all ages. The museum has ten exhibit rooms so everyone can have a blast. In these areas is where everyone is encouraged to touch, feel, play and explore with everything. You can do everything from milk a cow to be a fireman for the day. There are two floors to the museum where there is everything from a science area to music and bubble rooms. You can spend an hour or a full day at this fantastic children’s museum. Southern Utah has so much to offer no one can be bored, unless they choose to. When you are visiting Southern Utah, you will find there is something for everyone. The best part is that not all activities have to break the bank! After your ATV tour with ATV & Jeep Adventure Tours there is still time in the day to relax and take in some free activities.